Menu Monday kicks off this week with a creamy treat to satisfy your sweet tooth. 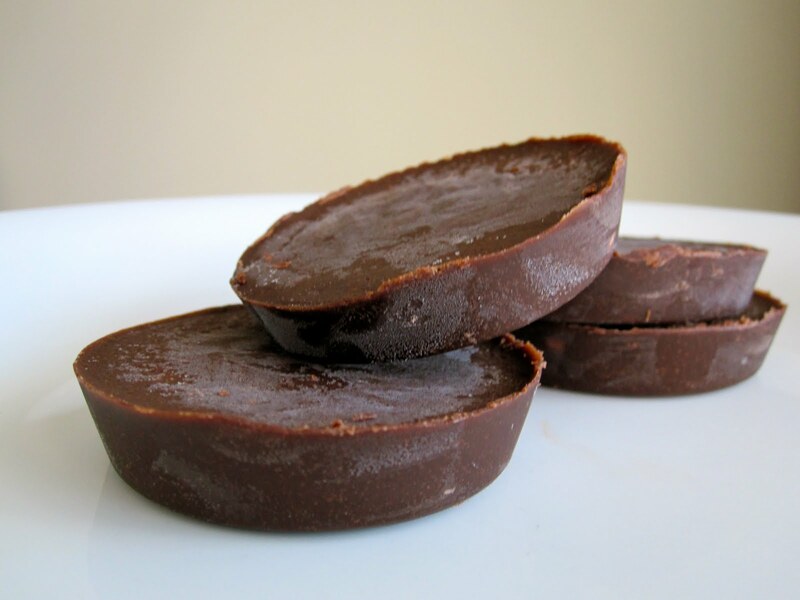 These fudge cups are so delicious, you would never know they were paleo. Hope you enjoy these as much as we do!!! Melt coconut oil. Blend all ingredients together in a food processor or blender. Pour into paper-lined muffin tin cups or silicon muffin cups and fill half-inch full. Makes 10. Chill for 30 minutes or freeze for 10 minutes. When firm, remove. Store in a sealed container in the refrigerator. And the truth is, yes, eating healthy does cost more than the “Standard American Diet”. But does it really cost more than eating out at your local Subway, Panera or Chipotle? The article makes a good point that your standard foot long sub (before drinks & a side) at Subway is $6-8, a meal at Panera is $8+ and if you want a burrito bowl at Chipotle plus guac you’re easily pushing $10! So is ModPaleo’s $10 meal really that expensive? You can either invest in your health now – buying whole, organic foods, having a gym membership, making time for working out – or invest in your healthcare later in life – Dr bills, prescriptions costs, working through pain & muscular degeneration. Where would you rather put your money?! 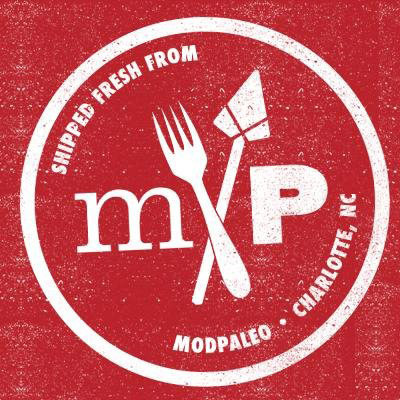 Check out ModPaleo‘s site if you’re interested in trying their food. They’ll ship right to your door step! You can order as needed or on a subscription. But at least you know you’re getting quality, locally sourced foods in a convenient heat & eat package! This recipe is so amazing and a must-have in our house. If you are like me, you could eat Mexican food all the time. The problem is the calories and fat you end up consuming when you got out to eat in the restaurants. This recipe allows you have the taste of Mexican you crave, without those pesky calories! This is an adapted recipe from PaleoOMG. In this new form, it is more work night friendly and more of a casserole style dish. Brush sliced sweet potatoes with coconut oil and place on a baking sheet. Cook in oven until softened. Remove and cool. Once your sweet potatoes are cooling, use skillet to cook your meat on the stove. Add in a bit of oil then add your minced garlic cloves along with your onion. When the onion becomes translucent, add in your ground beef along with your green chiles and spices. Let that cook down until cook completely through, using a wooden spoon to break up the ground beef and incorporate all the flavors. While the meat cooks, place a saucepan over medium heat for your sauce. Add your tablespoon of oil along with your minced onion. When the onion becomes translucent, add your tomato sauce and vegetable broth, as well as all your seasonings. Let that cook down until it thickens just a bit. Now once everything is done cooking, you can start layering. In an oiled 8×8 glass baking dish, start with sweet potatoes, then put a layer of your beef mixture, then sauce. Continue until done ending with sauce. If you are a cheese eater, sprinkle the top with shredded cheese. Place in oven and bake for 15 minutes. Or until heated through and the cheese is melted. Cool then eat your heart out! To cut some of the fat, you can substitute ground chicken or turkey and cut down the amount of coconut oil you use. I hope you all enjoy this one as much as I do!! Click here for the original recipe. This yummy, tasty treat is perfect for your summer BBQs & parties and the kids will surely like this one! Elana’s Pantry brings you this easy, Paleo friendly recipe. Combine blended coconut milk, water & chia seeds well. Add cacao powder, vanilla stevia & sea salt and blend together well. Refrigerate overnight to allow chia seeds to absorb liquid. Optional – top with desired fruit. Spiralizers are all the rage these days in the world of new kitchen gadgets, but they seem expensive & overrated. Today’s Menu Monday recipe comes from Elana’s Pantry & she continues to use her tried & true julienne slicer to make these simple, easy Zucchini Noodles. Use julienne slicer to slice zucchini into noodles. Heat olive oil (or preferred fat) in saute pan. Add zucchini noodles & seasoning. Saute & stir for 3-5 minutes until noodles are tender. Serve these noodles as a tasty side dish, under your favorite spaghetti sauce, or under a chicken/fish/shrimp dish. Enjoy! Happy Monday athletes! Today’s Menu Monday post will not disappoint. And with only 6 ingredients, it’s a super simple, one pot dish! You can’t beat that! The Not So Desperate Housewife shared this recipe here & I’ve even tried it with chicken breasts instead of pork. Either way, happy taste buds! Grease crockpot & place in pork shoulder (or chicken breasts). Sprinkle on garlic powder, chili powder & jalapeños. Dump drained pineapple on top. Cook on low for 6-8 hours until it shreds easily with a fork. Recently, Warren shared this recipe on the RISE blog. It’s another tried & true favorite! It hails from nom nom paleo & is an easy, weekly staple that everyone is sure to love! See the original recipe with pictures here.